Cook the quinoa: Rinse quinoa well and place in a medium saucepan with the water. Bring to a boil, turn heat down and simmer 15-20 minutes or until water is absorbed. Take off the heat, let sit for 10 minutes and then “fluff”. Set aside. Cook the chicken mixture: In a large saute pan, heat 2-3 tablespoons olive oil till shimmering. Add the garlic, scallions and crushed red chili flakes and saute 3-4 minutes. (Alternatively, heat 2 tablespoons garlic infused olive oil plus one tablespoon olive oil. Add the scallions and crushed red chili flakes and saute 3-4 minutes.) Add the oregano and the chicken and saute for about 5 more minutes. Add the quinoa and lemon juice and stir to combine thoroughly. Turn into a large serving bowl and cool to room temperature. At this point, proceed with the following and serve immediately or refrigerate until needed. If refrigerating, let the mixture come to room temperature before finishing the salad. Finishing the salad: Add the herbs, diced red bell pepper and preserved lemon or lemon zest, stirring to combine. Add the lemon dressing and stir to blend in thoroughly. Here you can add the feta cheese or you can pass a bowl of it after serving so each person can add what they want. 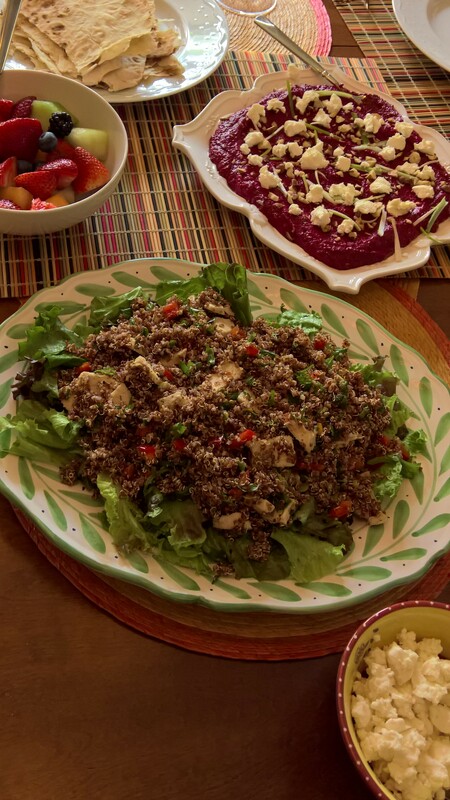 Serving the salad: Place a bed of salad mix on a platter and place the quinoa salad on top of it. Yum! !